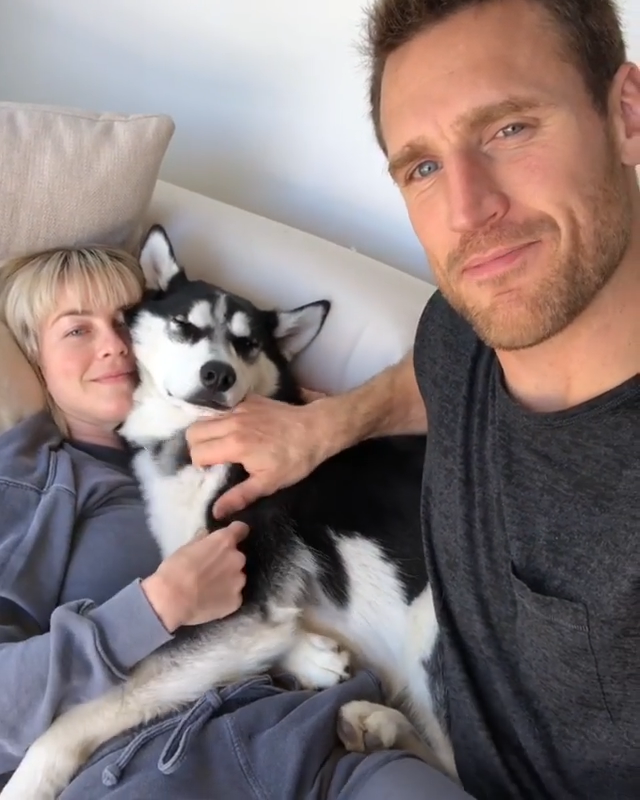 Julianne Hough and Brooks Laich are proud new (pet) parents! The couple welcomed an adorable husky to their household over the holiday weekend, and shared the happy news with a sweet announcement on Brooks’ Instagram page. However, apparently at least one of them wasn’t quite sold right away on keeping the new furry friend for good. Brooks introduced the “handsome boy” to his Insta followers with a cute video, and asked whether he and Julianne should make permanent space for another animal. Despite the inquiry, Julianne seemed to have her mind already made up. “I love him,” the dancer and actress said, as she and the doggo made picture-perfect snuggle partners on the couch. Between that and a slew of commenters pleading on the pupper’s behalf, Brooks obviously didn’t need much convincing. On Monday, the former NHL star posted a second clip to confirm that he and Julianne had officially expanded their brood. WATCH: Derek & Julianne Hough Show Off Insane Wakesurfing Skills On Summer Vacation! “Welcome to the family, buddy,” Brooks said, sharing that he and the new addition had just gone for a killer run together. In a series of videos posted to their respective Instagram stories, Julianne and her hubby also showed off just how well their four-legged pal was adjusting to his new brothers and sisters, including their two King Charles spaniels, Lexi and Harley. It doesn’t hurt that he has a real-life sibling close by to make the transition even easier – Nina Dobrev’s beloved husky is his sister! Although Julianne and Brooks’ new dog has had no trouble fitting right in, there was still one big puzzle piece missing – a name! Brooks asked his Insta fam for help choosing the perfect moniker, but Julianne’s brother Derek seemed to beat them to the punch. “Meet Koda,” the “World of Dance” judge said on his Instagram story, while carrying the “big baby” in his arms.